Our electrofishing (“shocking”) sampling is performed with a boat-mounted, pulsed-DC system. We use a specially-wound generator that's connected to a control box, which is connected to two booms with anode (positive) arrays attached to each end. The aluminum boat hull serves as the cathode (negative). The electric current produced by the electrofisher stuns scaled fish within a 5- to 10-ft radius of the anodes, depending on conditions. 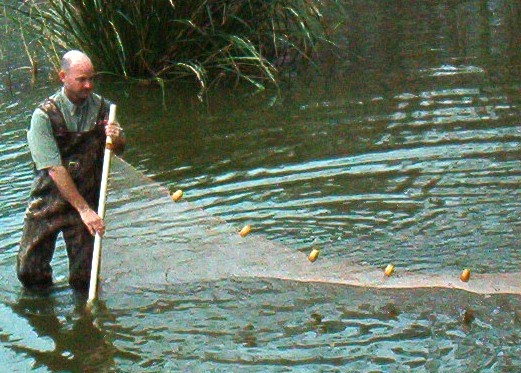 Fish are dipped up with a net and placed in an aerated livewell. The fish recover within a few minutes and can be released unharmed. The electrofishing is usually done around shallow cover, such as stumps, logs, vegetation, or other likely areas. A timer on the control box measures the actual length of time that an electric current is produced. After every 15 minutes or so of actual shock time, the fish are weighed, measured, and released. The total amount of sampling time depends on the size and shape of the lake. This information can be used as a snapshot of the current fish populations. Questions such as, “Are my fish getting enough to eat?”, “Are undesirable fish present?”, and “Are the fish populations balanced?” can be answered. Management recommendations—based on your objectives—can then be developed. Contrary to popular belief, electrofishing doesn’t sterilize fish, and when done properly it’s virtually harmless to fish. In fact, as part of his thesis research, Dave Hickman used a similar electrofisher to capture 48 largemouth bass. The fish were held in net pens for two weeks to assess mortality. Even though the experiment was carried out during the hottest part of the summer—normally when fish mortality is highest—none of the bass died! Although some smaller or already stressed fish may be killed occasionally during routine sampling, electrofishing is generally harmless to the overall population. Seining involves the use of a net to capture small fish, and can be used as an alternative to electrofishing on water bodies without a suitable place to launch a boat. Although the technique isn’t used to evaluate mature fish populations directly, it can provide a valuable information concerning the balance of the populations. We generally perform seine surveys during the summer, after bass and most other fish have spawned. We take several seine samples in shallow areas and then use a simple flow chart to explain management options. Average length at age of largemouth bass from Sample Lake compared to Louisiana state-wide averages. 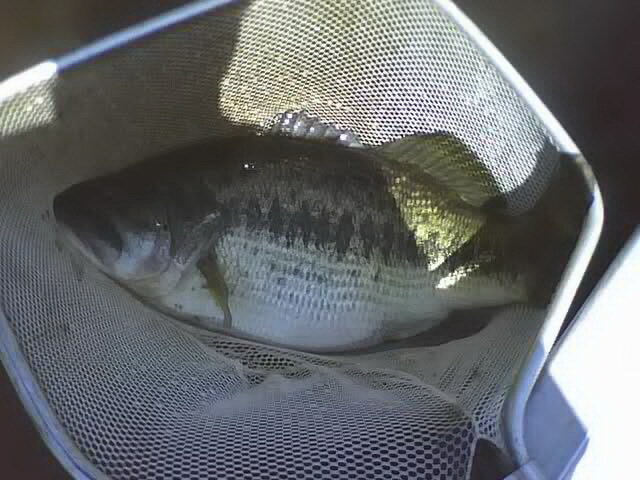 This graph indicates severe stunting of Sample Lake bass. Knowing the growth rates of your fish is important, especially if large fish are desired. An accurate idea of the growth rates of your fish can be very useful in assessing whether you have adequate forage and habitat available. Most largemouth bass in Louisiana live for eight years or less, so the faster they grow, the better chance they have of attaining trophy weights. Much like trees, annual rings on scales and other “hard parts” of fish are developed during alternating periods of fast (spring, summer, and fall) and slow (winter) growth. Fish from the northern hemisphere are assumed to have a hatch date of January 1, so a fish is considered to be age 0 (young-of-the-year) from the time it is hatched until the following January 1. The same fish is considered to be age 1 for an entire year beginning on January 1 of the next year, age 2 during the following calendar year, and so on. Ages derived from otoliths (ear bones) of bass are very accurate, but please note that the sample fish must be killed for this procedure. We occasionally use scale samples, which don't harm the fish. Unfortunately, ages obtained from scales collected in the southern US are not as accurate as those from otoliths due to the mild winters, but we try to get as large a sample size as possible to obtain a useful average. Fish are normally aged in autumn. Otoliths are broken though the center, sanded, imbedded in clay, and the cross sections viewed under a microscope so the annual rings can be counted. If scales are used, plastic impressions of several scales from each fish are viewed under a microscope.